The mystery of King Tut's death might finally be solved, according to one scientist who argues that the secret to the young Pharaohs demise is hidden in plain sight. Dr. Hutan Ashrafian, a lecturer and surgeon at the Imperial College London, says the key to the mystery lies in the art of the time, which depicted King Tut with highly feminine features, including enlarged breasts. 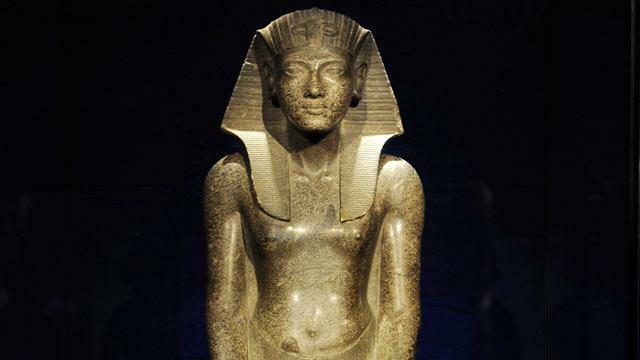 The enlarged breasts, he argues, are indicative of a condition known as gynecomastia, which, when added to a host of historical and familial evidence, indicates that Tutankhamun might have suffered and eventually died from temporal lobe epilepsy. Ashrafian says the first clue is in the relatively early deaths of other rulers who were directly related to Tutankhamun. "For all of them to die sequentially at younger ages is a sign of a genetic inheritance of some sort," Ashrafian said, adding "you could argue one of them died in battle, one of them was poisoned but none of them did die in battle. They could have been poisoned, of course, but it's very odd for sequential pharaohs who were aware that they could have been killed to be killed at such a young age." He also points to the great periods of religious change that Egypt went through, pointing especially to Tutankhamun's father, Akhenaten, who attempted to change Egypt's religion from polytheism to a more monotheistic one focused on the God Aten. According to accounts of the time, these changes were made after a series of powerful religious visions had by Akhenaten, visions of the sort that are often associated with temporal lobe epilepsy. Finally, Ashrafian said, one must take into account the manner of the death itself. "When they did a scan on his body, they found he died from a fracture, he had a fracture on his leg," Ashrafian said. "People who have epilepsy have a much higher incidence of dying from accidents and falls at a young age. They can also suffer from something called SUDE, Sudden Unexplained Death of Epilepsy. In general, they have a much higher incidents of dying young." Ashrafian says this is another piece of evidence that is supported by the art of the time. "He had lots of depictions of being with a walking stick," he said. "This was not common with the ancient pharaohs. Clearly, he had a condition where he might have had lots of falls, he might have died from one of these accidental falls." When taken together, Ashrafian argues, there is a clear diagnosis: The feminized features, the early deaths, the religious visions, the broken bones. "There's one condition linking all these elements together that's inheritable," he said, "and that's temporal lobe epilepsy."